Big breeze and ocean swell set hearts racing for the competitors in the Nanny Cay Cup. 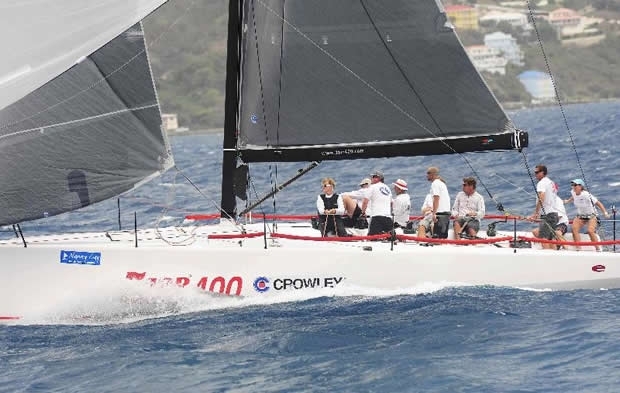 On the 22-mile race from Virgin Gorda to Nanny Cay Marina in Tortola, the the 34-boat fleet enjoyed blasting reach through the Sir Francis Drake Channel in gorgeous Caribbean sunshine. However, Peter Aschenbrenner's 63ft trimaran Paradox was given a separate course outside the channel. The giant multihull was searing through the ocean swell, often close to airborne and consistently hitting speeds in excess of 20 knots. Paradox completed her 25 mile course in just one hour and 40 minutes. In the Racing Class, Michael Shlens' Farr 400 Blade cut through the surf with precision to beat sistership Doug Baker's Magnitude, by over four minutes. Blade took the corrected time win in the Racing Class with Magnitude in second place. Third was Bill Alcott's STP 65 Equation which was the first monohull home by a significant margin. Blade had world-class tactician, Dee Smith on board. "The Farr 400 just loves these conditions," said Smith, who has been central to the development of the boat. "The all carbon structure means that Blade gets on the plane easily and the reach through the channel was a real joy. So far 10, Farr400s have been built and they are spread out all over the world, but it would be great to have a full class enjoying these fabulous conditions." There was high drama in the Cruising Class with a tie for first place on corrected time. BVI skipper, Antonio Sanpere with a crew from the Naval Academy Sailing Squadron is racing his J/36 Cayennita Grande. The local boat corrected out to exactly the same time as Shamrock VII owned by Boston sailor, Thomas Mullen. However, Shamrock VII and Alan Fougere's J/160 Avatar's results are subject to a protest hearing. In the Bareboat Class, Leonard Nekeman's Jeanneau Sun Odyssey 44i Lucky Dutch took line honours by some margin. Neil Harvey's Dufour 425 Acadia was next to finish, but only a single second ahead of Hans Schrederhof's Jeanneau Sun Odyssey 44i. The rest of the fleet were not far behind; a ball of boats competing for places meant that the entire chasing pack finished within minutes of each other. After time correction, the winner was actually the last boat to finish, Peter Rutkowski's Beneteau Oceanis 361 Perelandra. Bill Petersen and Peter Stazicker's Team Trolly Car were just 10 seconds off the winning time in second place from Neil Harvey's Acadia, which claimed third. Tonight the official Opening Party for the 41st BVI Spring Regatta took place and Michael Shlens Farr 400 Blade was awarded the Nanny Cay Cup for their outstanding performance in the Racing Division, especially by beating another one design Farr 400 by a significant margin but also for correcting out ahead of STP65 Equation, which is significantly larger that the 38ft long Farr 40.